New things to delegate to a virtual assistant! I recently started to go back to many networking and training events. What does this mean? Tons and tons of business cards! So I tried to look for a good CRM system so I remember to follow up with my contacts, and hopefully categorize them for future needs (buyer blast etc). CRM application. My dear fancy boss subscribe to a great CRM system called Solve360. It is the best and easiest to use CRM I have seen so far, for a price most business owners can afford. Well, I am just starting and I probably can not afford that (about $40/mon). So let’s look for a free one! I found Contactually. It is actually quite awesome. To me, Contactually reminds me to email my key contacts at the time I set myself for. For example, it asks me to email my old professors every 120 days from last contact. This is just want I need with a busy life ahead of me! 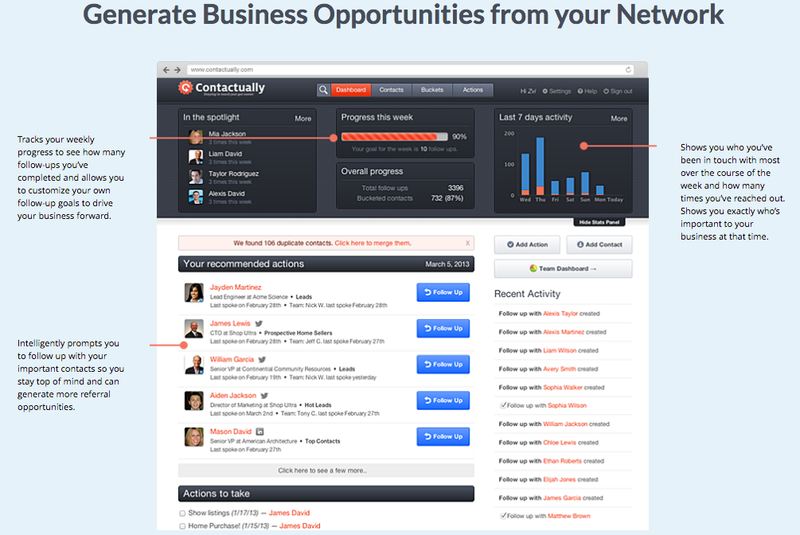 Did I tell you Contactually integrated with my LinkedIn, Facebook, and Gmail account? It automatically recognized my contacts across the board, a simple swipe and confirm from me lets Contactually reconcile all the information, and generate most accurate contact, activity and interactions between the contact and myself. I have been using it for a few days and there are still alot of things I can optimize my Contactually account! Love it! ← Seattle Apartment Rental vacancy drop – rental price for 1BR $1,800+!